The use of the left hand in jazz piano has undergone an interesting evolution. From the steady four-to-the-beat of ragtime, to boogie-woogie, to stride, to swing, to the modern dissonant clusters. If you’re a jazz pianist, you have a lot of history to draw from and aesthetic choices to make. Is there a logical way to make these choices? Here are some considerations. Imagine you’re a jazz pianist playing in a quartet, and your sax player just loves those rich, full bodied altered or extended chords you play behind his solo. Those spicy dissonances help him hear new possibilities, explore audacious lines, extend his chromaticism. Now it’s your turn to solo. Your right hand becomes a horn, and your start to weave your melodic tapestry. But what should your left hand do? One possibility would be to use it as a springboard for new ideas, just as it was for the sax solo. So you keep you left hand in the middle of the keyboard, as though it were ‘comping’ for the sax. This would be in the tradition of Bill Evans, Keith Jarrett and Herbie Hancock. But you could also utilize an approach popular with the bebop pianists of the 40s and 50s, like Thelonius Monk, Al Haig, Walter Davis Jr., Hank Jones, Teddy Wilson and Barry Harris. You would play a lot of bass notes and a few guide tones in your left hand. But no clusters. You could not play a Phrygian chord, or a bright 13 chord. So this approach would ‘lock ’ you in to a very specific stylistic idiom, which is fine if you wish to maintain the purity of a certain style, but would it be satisfying to you as an evolving musician? Jazz musicians are explorers, not conservators. If Louie Armstrong or Charlie Parker hadn’t stretched for new possibilities, jazz would be stuck in the Dixieland era. 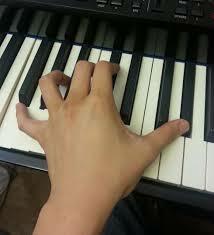 So the left hand may have to evolve to accommodate new chords and new harmonic solutions. In a trio setting, it’s important to relegate the bass note to the bass player, thus freeing the pianist’s left hand for greater color and variety. Sometimes bass players find themselves playing a tune they don’t know, so the pianist could initially outline the basic chords with simple chord shells in the left hand. But once the progression is learned, the duplication need not continue. As the left hand moves away from the bass notes, the colors explode, and we enter the modern era of jazz piano.